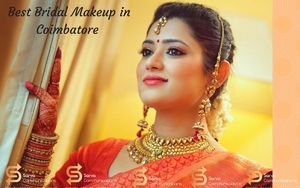 Bridal Makeup in Coimbatore - Looking for Bridal Makeup artists in Coimbatore ? Get best package quote from best bridal makeup in Coimbatore on Sarva Weddings. We understand your worry and all the pressure you have go through before your wedding and most importantly, the pressure of looking the best. It's just too much to handle with our team.